Evening readers, I know it’s a month until Christmas however one of my favourite department store is celebrating Christmas quite early this year. 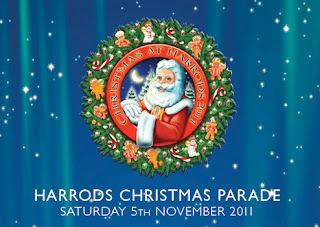 The Famous department store Harrods is having their Christmas Parade on this Saturday 5th November. The department store is known for their early celebration for Christmas, with opening their Christmas World in the middle of August! You do not require a ticket to attend our Christmas Parade. All times are subject to alteration. For the special occasion the restaurants of Harrods are doing a special breakfast buffet. It will be a fabulous day for all the family.